Due to a visa issue Horace Andy was unable to board his flight from Jamaica to the UK, and as a result he will not now be appearing at the Vale Earth Fair this weekend; however he will be replaced by another Jamaican reggae legend in Johnny Clarke “We knew there was a risk of Horace Andy not making his flight so already had a contingency plan worked out with his manager” said Rob Roussel, “I’ve saw them both perform earlier this year so know Johnny Clarke will be a fantastic replacement”. Thankfully both artists use the same backing band for UK shows, so it has just meant one name change for his flight. Andy is the only singer of Massive Attack's rotating group of guest artists to appear on each one of the band's albums. Other Massive Attack tracks featuring Andy include ‘Spying Glass’, ‘Name Taken’, and a reworking of his own track ‘Girl I Love You’ on their most recent LP ‘Heligoland’. He continues to tour worldwide with Massive Attack, and will be appearing with them across Europe at festivals early this summer. Warming the crowd up for Horace Andy will be BOMBS. They are a dynamic and charismatic 7 piece who combine trip-hop rhythms with blues and soul to create an edgy and individual sound. Live, they turn this into an incendiary performance with a healthy dose of rock n’ roll swagger. A favourite at festivals such as Shambala, Boomtown, and Bestival, they put a modern spin on their love of old records from the 30’s through to the 70’s, combining it with the styles of Radiohead, Beck, Bonobo, Black Keys and 90’s Hip Hop. Soon after forming they spent a summer performing at festivals with The People’s Front Room, a fantastic venue that boasted a quirky intimacy. They soon caught the eye of Chai Wallah’s joining them for an extensive festival tour in 2014. It was here that they met James Graham, an incredible piano player who immediately joined in with the songs they were playing and added an element that they soon couldn’t be without. Last to sign up was Rhii Williams, who joined the band on the drums having previously drummed with Zen Hussies (remember them?). Her steady, heavy beats and wild personality finally completed what the band is now – B O M B S! They have been described as a professional, brilliant, talented and fun. Great musicians who know how to work an audience and rock a venue - a band that envelops you, that is inspiring and interesting and individual, and you can’t stop watching them because they’re so infectious and curious - the best in hard hitting groove driven songs and air acrobatics! Check out the video for single Howl and you’ll get a good impression of their quirky nature which shines through in their live sets. Up before BOMBS will be the enigmatic Imperial Leisure. From their humble beginnings in London as a party band born out of school friendships, Imperial Leisure go from strength to strength, forever evolving their style but sticking true to their reputation for delivering fun and high energy live performances. Taking influences from all around, the music is a fun-loving throwback to the ska-2-tone era combined with more recent punk rock-hip hop sounds. It’s always a party and it’s always huge: gigs are an exhilarating experience from start to end with very little let up in between - don’t be surprised to end up dripping with sweat and cava spray! At the end of their set your clothes may lay about you tattered and boozy but you’ll still be wearing a great big smile. Drawing influence from bands such as The Specials, Roots Manuva, Less Than Jake, Rage Against the Machine and The Streets they’ve now released three acclaimed albums and toured the UK and Europe extensively, most recently with Hot 8 Brass Band on their recent tour. They’ve drafted in trombonist Joe Goltz from New York brass hip-hop collective the Youngblood Brass Band especially for their performance at the Vale Earth Fair so this is going to be a special experience! Imperial Leisure have played extensively across the UK and Europe supporting Ugly Duckling, Roots Manuva, UB40, The King Blues, Sonic Boom Six…. the list goes on! Clearly they love to get out on tour but without a doubt if you really want the Imperial Leisure experience you need to be at a festival, reaching new highs every time and pulling in the crowds, they’ll be a tough act to follow (though we’re pretty sure BOMBS and Horace Andy will be up to the challenge …). Before Imperial Leisure it’s time for some Hip Hop. “Having imported some big names from the hip hop world in recent years, it’s great to welcome back our own Asylum Seekas for a main stage show this year”, said Rob Roussel. Raw, straight up, original hip hop, Asylum Seekas are a trio that never fail to fill the stage. One of the crowds’ favourites is always ‘What’s that coming over the hill?’ but of course the Guernsey bus version. With DJ Miniroll laying down the beats every set is different, new and exciting. Apex is on honeymoon so Jimi Riddlz will be joined by a guest MC to deliver their witty and engaging lyrics with a local twist. Topping off the afternoon’s bands is Little Thief who are flying in fresh from playing Shambala festival the day before. Joining forces in May 2015, two mischief-makers started playing late into the night, armed only with a guitar, a drum kit and a passion for raw, unadulterated music, leading them into their first summer as ‘Little Thief’. They debuted their hard-hitting two-piece rock set at Glastonbury festival, then Bestival, then brought the mischief to the streets of Paris where, on a spontaneous whirlwind mini-tour, they caused trouble playing impromptu sets on the Parisian streets where the penniless duo made enough money for food and the fuel to get back home. At the end of the summer they scraped together enough cash to record their first E.P capturing the summer of 2015 entitled: ’Join The Mischief’. Before the band even launched, the duo started getting bookings from venues in Germany and the Netherlands, and being snapped up by more UK festivals. The band is an offshoot of BOMBS (see above) and have now expanded into a three piece. Originally featuring Charlie Fitzgerald on guitar and husky lead vocals, and Rhii Williams on drums and soft but punchy female harmonies, they have drafted in bassist Paul Hopkins (also of BOMBS). Their stripped back instrumentation delivers a perfect picture of sound that demands attention, and the Vale Earth Fair is delighted to announce that they are staying on to play the legendary wind-down gig at the De La Rue on Monday 27th August, which neatly rounds off the Vale Earth Fair weekend, with support from Vale Earth Fair compere Grant Sharkey. Opening the Vale Earth Fair will be Richey Powers, better known as The Recks frontman – those present for the Vale Earth Fair’s Unplugged gig earlier this year will know it’s worth getting to the Vale Castle early. Richie will be closely followed by a rejuvenated and expanded Rentoclean, with Andy Coleman joining on trombone and Micky Meagher on percussion. 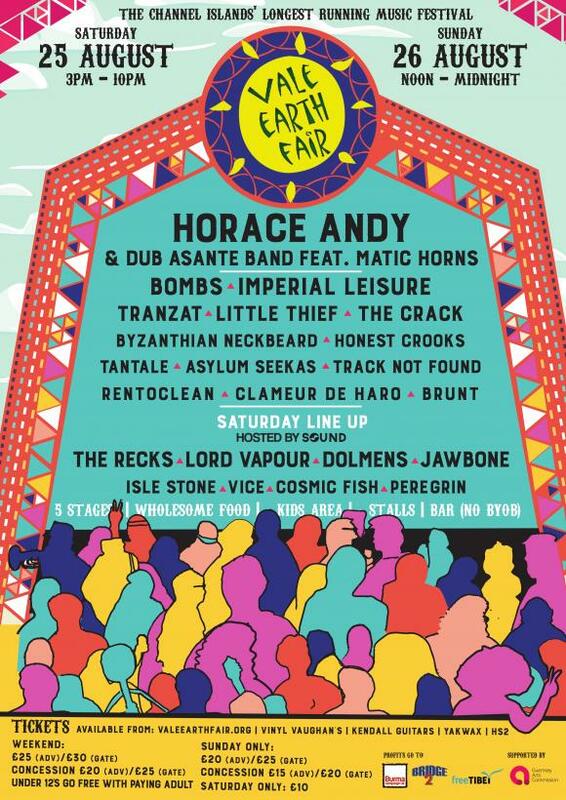 The first visiting band to appear will be The Crack from Jersey at 2:30pm, who made such an impression on the Viewalalu Stage last they had to be asked back. Led by Martin Coxshall who’s previous band The Loneliest Monkfish are well remembered from their Vale Earth Fair sets in the late nineties/early noughties - they put some fun into live music with an incredible show that verges on the bizarre. Completing the afternoon’s line-up are Honest Crooks and Tantale, who probably don’t need much of an introduction to those who know the local music scene, but certainly deserve it - check them out online. The universe is big and beautiful. From sparkling stars to the deepest, darkest corners, it continues to surprise, and the Viewalalu stage at Vale Earth Fair 42 is no exception. From the cosmic supernovas that are Track Not Found, sounds to stare at stars with from Brunt and Dolmens, and enough noise to reach the moon and back from Byzanthian Neckbeard, this year’s line-up for the Viewalalu Stage have enough talent to bring visitors in from any planet (yes, it’s a space theme for the stage this year!). The main visiting act this year come to us fresh from Motocultor festival in Brittany; Tranzat will make their interstellar debut performance outside of France. Having seen them support Kadaver earlier in the year, stage coordinator Jade Kershaw decided it was time to bring over some out of this world prog metal to Guernsey. “Me and my partner turned to each other and both just stated ‘Earth Fair’. Tranzat incorporate some epic mental sounds into this totally engaging performance. I’m absolutely sure they're going to go down a storm!" Straddling the eternal classics of rock and the progressive metal of 90's - 2000's, Tranzat's four retro-futurists travel through time in search of unheard of sounds. Their second LP is about to appear and they will be showcasing material from that at the Vale Earth Fair, along with other earlier works. Tanzat will also be playing at the De La Rue for the Vale Earth Fair warm up gig on Saturday 25th August along with The Crack from Jersey – live music from 9pm, free entry. Electric Brick are also being teleported into the Vale Earth Fair from Jersey for their first appearance at on Guernsey. These Gorey boys are retro rockers with the hair and outfits to prove it! The main change to the Vale Earth Fair this year comes from the upgrading of the Busking Stage to the Acoustic Lounge, replacing the former Dance Zone, although it will evolve into a House Party in the evening, combning elements of both. Hot Plastic pop over from Jersey to appear here, and Lord Vapour will be playing an acoustic set wil be another highlight.